3.2 Starting a new simulation or resuming an existing one. 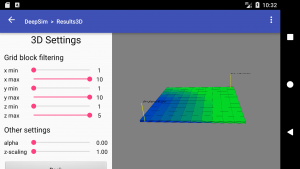 Thank you for installing DeepSim on your phone or tablet. DeepSim is designed to be an intuitive reservoir simulator. Even though DeepSim is designed to be intuitive in its use, sometimes things might not be immediately clear. The purpose of this manual is to help you on your way as soon as possible. For technical details on you are referred to the coming technical reference manual. Note: this manual in currently a work in progress. If a particular section is not available yet, please check back later, most likely the missing sections will have been added. The main menu provides a two line summary of the current simulation setup. Specifically it list the grid dimensions the number of components that are going to be used in the simulation. The “Change setup” button will take you to the setup screen. From there you can change anything in the current simulation setup. The “Simulate” button will take you the simulation menu, from which you can start or resume simulation runs. The “Results – Graphs” menu can be used to show current simulation results in the form of graphs at both the well and field scale level. 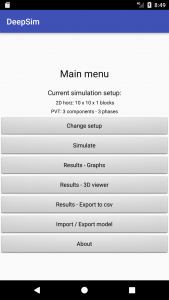 The “Results – 3D viewer” screen, you can view the simulation outcomes in 3D. The “Results – Export to CSV” screen will allow you to export simulation results for selected wells (or field level) in the CSV (comma separated values) format. The resulting CSV files can be post-processed in tools like Excel or Matlab. The “Import / Export model” button will allow you to save the current setup or load a previous setup from file. Finally the “About” button will show you version info and link for more information. Each screen will be described in more detail in later sections. From the simulation menu you can either start a new simulation, or extend a currently ongoing simulation. Starting a new simulation or resuming an existing one. To start or resume a simulation, simply select the length of time you wish to simulate for and press the “Go!” button. The “Go!” button will either start new simulation or resume an existing simulation. The “Go!” button will start a new simulation if something has changed in the simulation setup since the last simulation run. The “Go!” button will resume an existing simulation if nothing has changed since the previous simulation run. The graph will show field level produced oil and water rates. The text showing recovery factors for oil and gas will be updated. The cumulative amount of oil/gas/water will be updated. Simulation can take a significant amount of time. If you wish to do something else while waiting, DeepSim will continue the simulation even if DeepSim is not running in the foreground. The setup menu provides access to a number of sub-menus, that will allow you to change all variables in the simulation model. 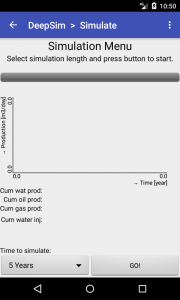 Wells – to add or remove new producer or injector wells. Each of the submenus will be discussed in detail below. Size of an individual grid block in x, y, z direction. Rotation of the grid w.r.t. x, y and z axis. The rock properties menu allows you to change permeabilities, porosities and rock compressibilities. Each property can be set to a different values per grid block layer. This allows you to build so-called layer-cake models. To set the permeability in a certain direction (either x, y, or z direction), chose the corresponding tab. Deepsim will then display the permeability per layer. To change a permeability simply tap on the number and type in a new value. For convenience, three options are available to quickly set the permeabilities for all layers. First there are the ‘Copy from perm x/y/x’ buttons. Clicking on these buttons will open a dialog asking for a multiplier that is applied after copying all values. Secondly there is a button called “Set to a constant”. Selecting this button will open a dialog window that asks for a permeability value. After selecting a value, all layers will be assigned this permeability value. To set the porosity or pore volume compressibility, chose the corresponding tab in the Rock properties menu. Deepsim will then display the porosity of compressibility per layer. Porosity is defined as , where GBV is the Grid block fluid volume, GRV is the gross rock volume and is the porosity. For convenience all porosities or compressibilities can be set in one go. This can be done by pressing the “Set to a constant” button . Selecting this button will open a dialog window that asks for a value. After selecting a value, all layers will be assigned this value. The volume flux per phase depends on the relative permeability. 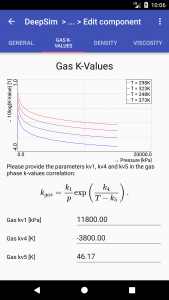 In the relative permeabilities menu you can set the relative permeability for each phase as a function of the phase saturation. For this purpose three tabs are available, a water tab, an oil tab and a gas tab. Once a tab is selected, the currently used relative permeability is plotted as a function of the phase saturation. To change the relative permeability behavior, you can change the Corey-parameters below the graph. Note that in DeepSim the phase relative permeabilities are only dependent on the phase saturation itself. 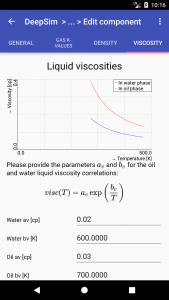 This is a slight simplification compared to the default relative permeability models found in other simulators where the middle phase (usually oil phase) is calculated as a function of the most wetting an least wetting phase saturations. 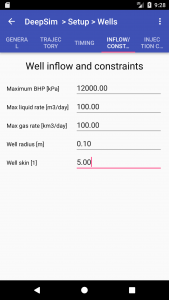 In the capillary pressure menu you can set the capillary pressure (Pc) difference between oil – water and gas – oil saturation as a function of either the water and oil phases. What this means in less mathematical terms is that the Pcmax parameter determines the maximum Pc difference between phases that will occur at connate water or oil saturations. The Pc entry parameter determines the capillary entry pressure, ie. the pressure at maximal water and oil saturations. The Pc curvature parameter determine how curved the line between maximum and entry Pc is. The higher the curvature number the more curved the line will be. The beginning and ending saturations are read from the Relative permeability curves to ensure consistency. As usual in DeepSim, the provided graph will automatically update as you change the numbers. DeepSim is a compositional reservoir simulator. That means that simulate the flow of oil and gas you need to supply the components that make up the water, oil and gas phases. In the PVT menu, you can select the component that you would like to simulate in the various phases. Selecting components is as simple as selecting the various check boxes. 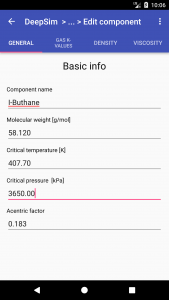 If you want to see the component properties, tap on the name of the component. 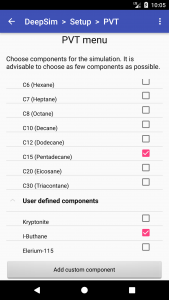 For user defined components, you can now also edit component properties. For built-in components, the properties are read-only and cannot be changed. Tip: the simulation time is affected by the number of components chosen. It is advisable to select only those components that are strictly necessary to get approximation to phase behavior. Other than selecting the phase components, you will also need to specify that initial mass fractions of each component in the water, oil and gas phases. This is done in the Initialization menu (see next section). WARNING: When you define your own components, take care that properties are physically consistent, otherwise simulations will fail! To create a new custom PVT component, go to the Setup -> PVT menu. The new PVT menu, will display not only the standard built-in component, but the new custom components as well. To create a new component, press the ‘Add new component’ button’. This will bring you to the Edit Component menu. The first thing to do is to give the component a new name, and supply basic data, such as molecular weight, and critical properties. These properties will be used to calculate the components gas phase density. In subsequent versions of DeepSim we will also offer the functionality to directly estimate the kv1-kv5 parameter directy from an EOS. Liquid phase densities can be entered using a simple linear correlation, see below. Once the component is defined, is can be set in the initial oil, gas and water compositions, just like the built-in components. New custom components can also be used to in the injection composition of injector wells, for more EOR functionality. To delete a custom component, simple swipe to delete the component. Before a simulation can be started, DeepSim needs to know what the initial state of the reservoir is. The Initialization menu allows you to set the initial state of the system. Capillary pressure curves (for possible transition zones). In the hydrostatic initialization menu, you can enter the first three sets of numbers. Capillary pressure curves can be entered in the capillary pressure menu. The hydrostatic initialization menu contains four tabs. In the first tab you are asked to enter initial pressure, temperature and initial contact data. In the remaining three tabs you can enter the composition for each phase. In the first tab you are requested to enter initial pressure and temperature. Since pressure is dependent of depth at which the pressure is measure, the reference depth (datum) for the initial pressure is required as well. The other information requested in this tab are the initial oil – water and oil – gas contacts. Since Android does not allow entry of negative numbers, positive numbers are used for depth. Higher positive numbers correspond to deeper contact levels. 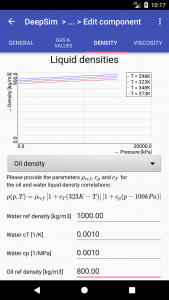 To simulate a reservoir with oil, make the oil – water contact equal to the gas – oil contact. To simulate a reservoir without gas or water, either supply a gas oil contact above the reservoir or a oil water contact that is below the reservoir. Once you are satisfied with the input, you can check the initial status of the reservoir by pressure the ‘Preview Initialization’ button. This will perform a quick calculation of the initialization and will show you the result in the 3D viewer. In compositional simulation model (DeepSim is fully compositional), the user needs to specify not only the initial phase pressure, pressure and contacts, but also the composition of each phase. The composition of each phase can be altered by clicking on one of the phase composition tabs. In the tabs, the top half of the screen shows a graph of current phase properties (density, viscosity, Rs, rs, Bo, Bg where relevant) as a function of pressure. The bottom half of the screen has the phase composition. Phase composition has to be entered as mass fractions. It is not important that the mass fractions do not exactly sum up to one, if necessary DeepSim will re-normalize the mass fractions. As you change the phase composition, the phase property graphs will automatically update, so that you can directly see the consequence of the changes as they are being made. Aquifers can be important features in reservoir simulation. In case of a well connected and strong aquifers, an aquifer be the main supplier of drive energy. In such scenarios, it is obviously important to capture the aquifer properties properly. Explicitly modeling an aquifer mean the the simulation grid is extended such that all aquifer water can be explicitly captured in the grid. Advantages of this approach are that you have same extensive simulation accuracy and flexibility at you disposal modeling the aquifer as you have for modeling the hydrocarbon bearing zones. Downsides of explicitly modeling an aquifer are that modeling an aquifer analytically requires a high number of extra grid blocks to be added to the simulation model. Given the size of aquifers, this will often slow down the simulations tremendously. The alternative to modeling an aquifer explicitly, is to do it implicitly by attaching an analytical aquifer to the edges of the simulation grid. What this means is that we replace the explicit aquifer blocks by an analytical (thus fast) proxy model that closely matches the aquifer behavior. Since analytical aquifers can give nearly the same simulation results a a fraction of the simulation time, analytical aquifers are comely used in reservoir simulation. For an overview of analytical aquifer models the reader is referred to the excellent PetroWiki website. Fetkovich radial steady state aquifer model. For a description of Fetkovich analytical aquifer models is available at the already mentioned PetroWiki website. Adding an analytical aquifer in a DeepSim simulation model is relatively simple. Simply to the setup -> aquifers menu. To change an aquifer properties, tap one of the aquifers (North/East/South/West). 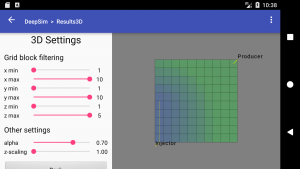 DeepSim will then open a menu with detailed aquifer properties. To active or deactivate the aquifer, click on the checkbox widget. The aquifer type and aquifer extent can be altered using their relative input fields. All other aquifer properties (permeability, thickness, porosity, width, height, compressibility) are copied from the adjacent grid block. This means if a grid block property changes, so do the aquifer properties. Before discussing the various well options, it is important to understand the well model used by DeepSim. 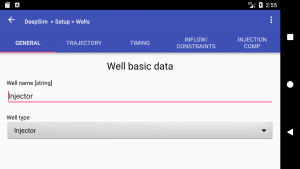 Since each well has independent inflow/outflow calculations, a well can cross flow between well segments. with the mass flux of component c in phase p, the mass fraction of component c in phase p, the viscosity of phase p, the Peaceman radius, the well radius and S the well skin. When the Wells menu is opened, the user is presented with a list of currently available wells. To add a well, press the ‘Add new well…’ button at the top of the list. After clicking the ‘Add new well…’ button the well-details activity will be opened, where you can enter the various well parameters (see subsequent sections). To remove an existing well swipe right over an existing well name. This will remove the well. To edit parameters for an existing well, simply tap on its name. After tapping on the well name, you will be presented with the following screen. The five tabs on the navigation bar represent the different categories of well parameters. Each tab will be explained below. In this tab, you can modify the well name and the well type. For the well name, it’s recommended to choose a short, but meaningful name. In the ‘Trajectory’ tab you can set parameters that determine the well trajectory and perforation. Then, the well location can be specified. The well location is to be given in grid block numbers. Entering a location that is currently outside of the model, will result in a warning will being given. The length of a well is given by entering starting and ending grid block coordinates along the well orientation (ie. starting and ending z-coordinates for a vertical well). A well is assumed to be completed and open to the reservoir in all grid blocks from the starting and ending grid block numbers given. To model wells starting after a number of year, or wells being abandoned, the ‘start time’ and ‘stop time’ parameters allow you to pick a well starting and ending time. Note that before the starting time and after the ending time, DeepSim will behave as the well does not exist. This means that there is no cross flow either before / after well is active. In the Inflow / Constraints tab, you can enter parameters related to the fluid inflow and the flow constraints. The bottom hole pressure constraints will limit the minimum BHP for a producer or the maximum allowed BHP for an injector. If a well exceeds the BHP constraints, DeepSim will first try to reduce well flow rates. If a well cannot flow without violating BHP constraints (even at reduced rates) the well will be shut in at surface. Note that if a well is shut in at surface, well bore cross flow between well segments is still allowed to happen. Inflow / outflow of a well interval is in part determined by the well radius and well skin (see equation in DeepSim well model section). Both well radius and skin can be provided. 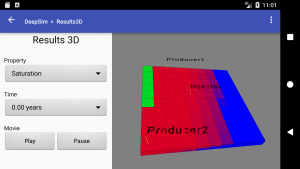 In the final tab, the injection composition for an injector well can be set. By default a new injector in DeepSim is a water injector. As such the mass fractions for injectors is initially set to 1.0 for the H2O component and 0.0 for all others. 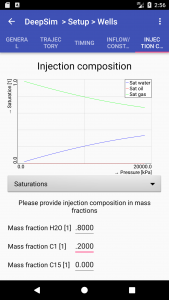 If you would prefer to inject gas, the injection composition can be changed to 0.0 for H2O and 1.0 for C1. This turn the well into a gas injector. The mass fractions of can be freely chosen, you could also choose to inject oil, or a mixture of oil gas and water. Since the subsurface composition of the injected fluids will be dependent of the subsurface pressure (and temperature as set in the initialization menu), a convenient chart is provided in which you can see the subsurface properties of the injected fluid as a function of the subsurface pressure. In the Results – Graph section section you can graphically visualize results from a simulation. Graphs are available at both the well and field level. Zooming in on areas of interest can be done via pinching and double tapping. Note that pinching and double tapping is possible in all other graphs in DeepSim as well. All reported rates and cumulative volumes are at assumed surface conditions (298K and 101 kPa). with N the total number of grid blocks. The average pressure calculation does not weigh grid block pressures with grid block volumes. So for both oil and gas, the recovery factors include not just the oil and free gas, but also the associated gas and condensates when calculating recovery factors. The reported well pressure is the bottom hole pressure (BHP) for the first perforated node of the well. Note that this pressure will generally be either higher (for injectors) or lower (for producers) than the corresponding grid block pressure due to the pressure drop between the reservoir and the well. In the Results – 3D viewer graphically visualize results from a simulation. In the 3D viewer you can visualize the reservoir properties at a given time. To get an understanding how the reservoir behaves as a function of time, a movie functionality is available as well. Due to space constraints on the phone platforms, the 3D viewer is only available in landscape orientation. When the 3D viewer is opened, the screen is split into two parts. On the left hand side there are the control buttons. On the right hand side, there is top view of the reservoir. By default, properties are displayed as they where at initial conditions (t = 0.0 years). To see saturations and pressures at later times, the reservoir time spinner (2nd spinner from the top) can be used. DeepSim allows you to visualize pressures and saturations at yearly intervals. Porosity and permeability are only available at initial times (even though porosity changes due to compressibility effects). Finally the bottom two buttons can be used to start a movie. When a movie is started, DeepSim will automatically cycle through all available times a property is available. After the last time at which the property has been calculated has been displayed, the movie will automatically restart at t = 0.0 years. Rotating the reservoir is also possible while a movie is being displayed. To zoom in or out, use the usual pinch gesture. To zoom in put two fingers on the screen and drag the fingers apart. To zoom out, put two fingers on the screen and pull them together. Using the x-min, …, z-max sliders, you can conveniently select the grid blocks you want to display. With the grid block transparency we can see that the injector well is in fact a horizontal wells, perforating the first 5 blocks from the bottom. Now the individual layers are easily visible. Saving the current setup can be done by going to the “Load/Save/Export” menu. Then (in the load/save tab) type in the model name and press the save button. DeepSim will confirm if the model was successfully saved. Note that only the model setup is saved, simulation results will need to be rerun. Models are saved in the “/sdcard/deepsim_data/” directory of your phone. Loading a previously save model is very similar. In the same load/save tab, select the model you wish to load, and click the ‘Open’ button. DeepSim will confirm the model is successfully loaded. If you want to export a DeepSim model on your phone or tablet to a traditional workstation reservoir simulator such as CMG STARS, CMG IMEX or Shell MoReS, go to the ‘Export’ Tab in the ‘Load/Save/Export’ menu. A model can be exported by typing in the export name, selecting the required formal (currently limited to CMG STARS, CMG IMEX or Shell MoReS) and pressing the ‘Export’ button. DeepSim will then ask you if you would like to send the exported deck to via email/other comminication tool to your desktop. We should note that if you export a model to another simulator, not all features of a model can be retained. For instance, because CMG IMEX is a black oil simulator, DeepSim’s more detailed compositional PVT information can only approximately be converted. The table below lists which properties are conserved when exporting DeepSim models. Overview of properties that are conserved when exporting DeepSim models to other reservoir simulators. 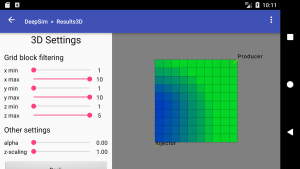 The preferences menu allows you to customize the way you interact with DeepSim. You can change the input or output units or the color scheme in which the graphs are presented. To go to the Preferences menu, press the menu button at the top right of all screens, then select preferences. To change the unit system from the default SI like units to field units (or back again), simply select the Units option from the Preferences menu. Currently the options are: SI-like (length in m, pressure in kPa etc), or field like (length in ft, pressure in psi etc). In different countries and companies, there are different coloring conventions on with which color to represent oil and gas. In the Color Scheme menu you can pick your favorite setting. Options are to either set oil to green and gas to red, or the reverse. Prior to DeepSim v2017.10, DeepSim would represent oil by red colors and gas by green colors both in graphs and in the 3D viewer. This is the color scheme to which the developers of DeepSim are most accustomed to. In 2017.10 we changed this to the more common oil is green and gas is red scheme.